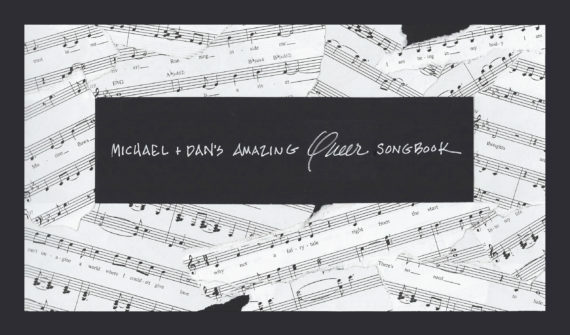 Michael & Dan’s Amazing Queer Songbook is a musical memoir celebrating our 43 years together as songwriters and partners in life and love. Songbook features 20 of our original songs – tunes originally created for our performance art musicals and theatre pieces as well as inspired by some of the amazing people we’ve met along the way – from pleasure activist Annie Sprinkle to marriage activist Edie Windsor. In October and November 2018 we filmed and recorded the first group of these songs with a stellar group of musical theatre performers in New York including Billy Bustamante, Annie Golden, Brandon Haagenson, Donnie Hammond, Austin Ku, Jillian Louis, Jesse Manocherian, Javier Munoz, Sheri Sanders, Howie Michael Smith, and Nicole Van Giesen. In early 2019 we’ll launch an online platform to share the films – as well as original text and archival photos that document what was happening in our lives when we were writing each tune. This is a legacy project for us – so that our songs will be shared, known, and live on past us – documenting and celebrating our unique story of love and collaboration.